Ambassador of Indonesia to Thailand, H.E. Ambassador Ahmad Rusdi (right) with Prof. Worsak Kanok-Nukulchai. Ambassador of Indonesia to Thailand, H.E. Ambassador Ahmad Rusdi assured the Asian Institute of Technology (AIT) of full support as he welcomed cooperation between AIT and higher education institutions in Indonesia. On his maiden visit to AIT on 5 March 2018, Ambassador Rusdi spoke of the importance of international cooperation and stressed the need for educational cooperation. Greeted at AIT by President Prof. Worsak Kanok-Nukulchai, the ambassador highlighted the importance of economy, infrastructure, defence and education, particularly in the context of ASEAN. AIT President Prof. Worsak spoke of the historical relations between AIT and Indonesia. “Indonesia has been a member of the AIT Board of Trustees since 1968,” Prof. Worsak remarked. Further, AIT has produced 816 Indonesian alumni so far, and it has two faculty and five staff members from Indonesia. AIT has also signed cooperation partnerships with various institutes and universities in Indonesia, he added. The Ambassador also interacted with Indonesian students at AIT, exhorting them to do their best in studies as well as participate in co curricular activities. The visiting delegation also visited the renovated and modernized AIT Library. The Ambassador was accompanied by Mr. Lingga Setiawan, Minister Counselor; Prof. Mustari M. Pd, Education and Cultural Attache; Mr. Wahyu Eka Putra, Immigration Attache; Mr. Olih Sodikulhikmah, Principal of Indonesian School of Bangkok; Mr. amsul Hernoto, Research Attache; Mr. Adul Leesen, Staff of Education and Culture Division; and Ms. Nisa Nuraini, internship student of Gadjah Mada University. Ambassador of Indonesia to Thailand, H.E. 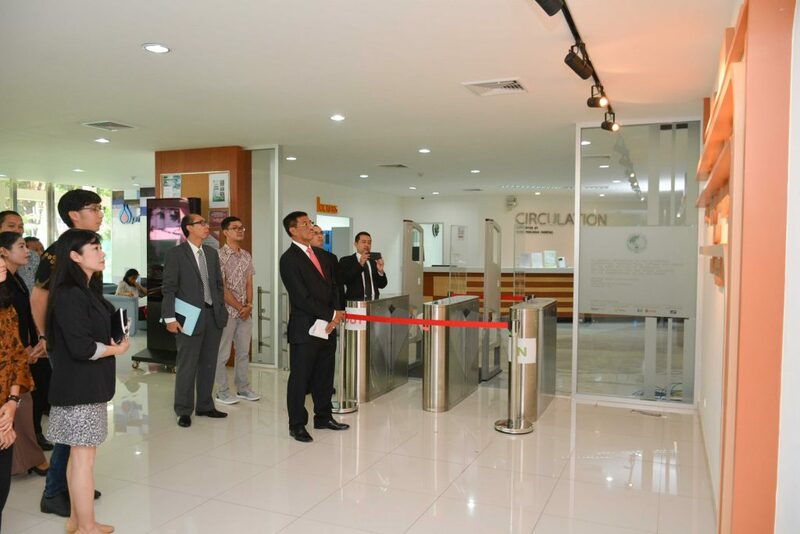 Ambassador Ahmad Rusdi at the AIT Library.